African Barrick's Bulyanhulu mine, Tanzania. African Barrick Gold (LON:ABG) joined the long list of bullion producers affected by last year’s falling prices. Delivering its preliminary results for 2013 Wednesday, the company announced it was slashing its gold reserves by almost a quarter, but said it expected a profitable year on the back of cost cuts and higher production. Tanzania's largest gold miner posted an annual net loss of US$781 million caused by total impairment charges of $823 million, as the miner wrote down the value of some of its assets in light of lower gold prices. 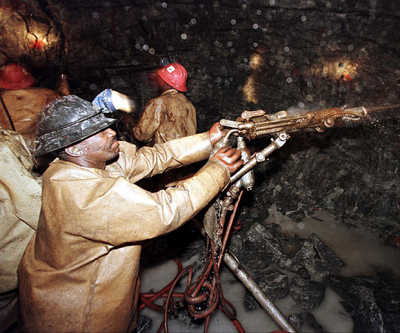 In 2012, African Barrick reported instead a profit of almost $63 million. The miner, majority owned by Canada's Barrick Gold (TSX, NYSE:ABX), said it aims to cut its benchmark operating costs by up to 19% in 2014 after a 14% reduction last year. At the same time, the miner vowed to up production to between 650,000 and 690,000 ounces of gold this year, reducing cash costs to between $740 and $790 per ounce sold, and continuing to reduce all-in sustaining costs to $1,000 to $1,175 per ounce sold. “2013 was a year of significant change within ABG (…) We identified over US$185 million of cost savings across the business ranging from reductions in capital spend, exploration, corporate overheads and organisational structures,” said Chief Executive Brad Gordon, who took the top job in August last year. In a statement, London law firm Leigh Day, complained that the company made no mention of the "multiple deaths and injuries" to local villagers that have occurred at the firm's North Mara mine, one of Tanzania’s largest gold mines, over the past year. These allegedly include four deaths at the mine in the past month alone. According to Gordon, North Mara had "a fantastic" year in 2013. "As far as I am concerned, North Mara is a great asset. You won’t get many better assets than North Mara in Africa. We produced 256,000 ounces at North Mara at reasonable costs,” he said in today's statement. “It’s sickening that a company that talks about respecting human rights can claim one of its mines had a ‘fantastic year’ at the same time as people are regularly being killed and injured at the mine,” said Richard Meeran, Leigh Day partner, who in July last year launched a lawsuit against African Barrick Gold and North Mara Gold Mine Limited as "accomplices in the killing of at least six local villagers by police." African Barrick’s shares, which have more than doubled in price since June, went up a further 2.4% to 245p in London today.